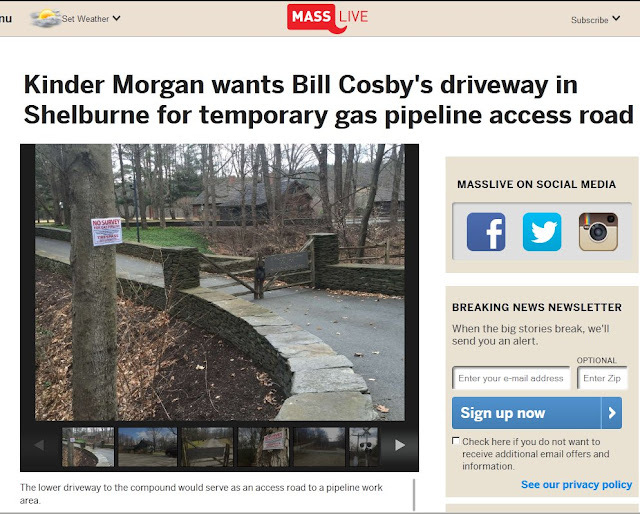 BillHustonBlog: Was Bill Cosby "taken out" by Kinder Morgan? (11/13/2018): I am honored that someone has featured this blog post in a video! Thanks M. Mitchell! I have no idea about any of the Cosby sexual assault allegations. Maybe the victims are real. I don't know. I am only noticing a very strange coincidence in the timing. I have seen the gas industry use a (false) charge of sexual depravity to take out another activist. 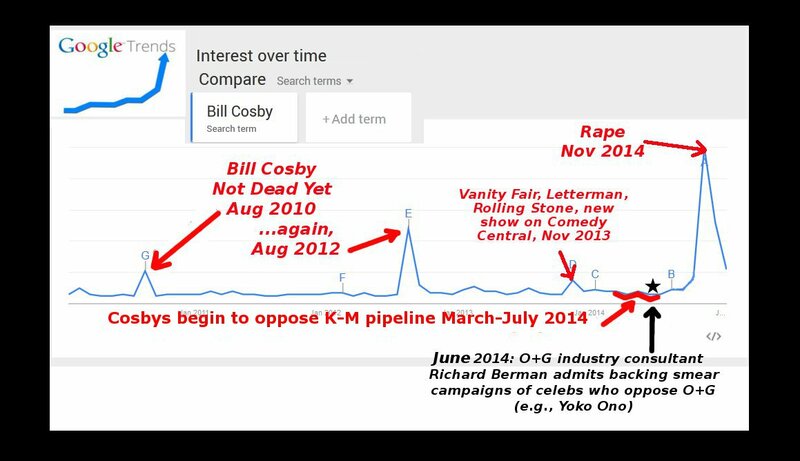 Aug 2010: Big News Spike: Bill Cosby defending internet rumor that he's dead. Aug 2012: Two Years Later: "I'm still not dead". Nov 2013: Cosby has new show on Comedy Central, PR in Vanity Fair, Letterman, Rolling Stone, etc. March 10, 2014. Bill Cosby's Wife writes an op-ed. 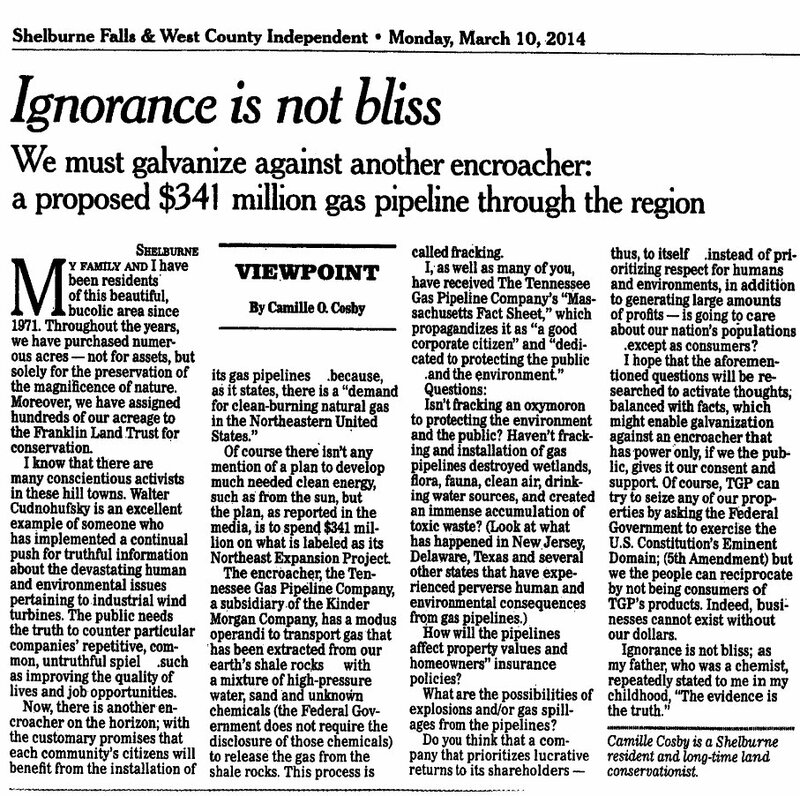 "How will the pipelines affect property values and homeowner's insurance policies? What are the possibilities of explosions and/or gas spillages from the pipelines? Do you think that a company that prioritizes lucrative returns to its shareholders -- thus to itself, instead of prioritizing respect for humans and environments, in addition to generating large amounts of profits -- is going to care about our nation's populations?" BOSTON —Comedian Bill Cosby and his wife Camille are supporting protesters marching across the state in opposition to Kinder Morgan's proposed natural gas pipeline. The couple, who own hundreds of acres of protected land in Shelburne Falls, about 100 miles west of Boston, have been opposed to the pipeline since the company notified them last winter of plans to survey their property. The couple, through their spokesman, said it was "astounding" that New England's six governors support the proposal, which they said shows "disrespect for humans, flora and fauna." 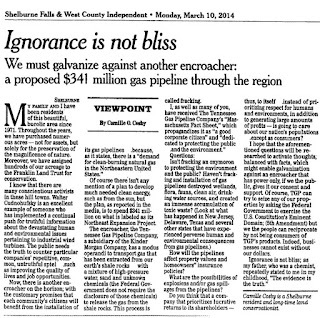 Supporters of the $3.75 billion Northeast Pipeline Extension Project say it will provide more clean-burning domestic natural gas to the Northeast market. Oct 30 2014: NY Times and PRWatch.org publish the Rick Berman Tapes. PR master Rick Berman, a/k/a "Dr. Evil" is secretly recorded at a conference in June bragging about how he can take down celebrities for secret clients and no one can trace it back to him. This is at an energy conference! November 16, 2014 Washington Post: "Why Now?" Lots of people fighting the Kinder-Morgan NED. Several Facebook groups, and email lists. People are training for NVDA. Do you think after all this family has been through they have harassed them into consent? Thanx 4 putting in the work Bill! Even more relevant now!